LONDON, Jun 19, 2014/ — Unveiling its menswear collection on Tuesday, Jun 17th, Tiger of Sweden stayed true to its 111 year-old design philosophy – “A Different Cut” as it once again fused urban wear with Wall Street suits. 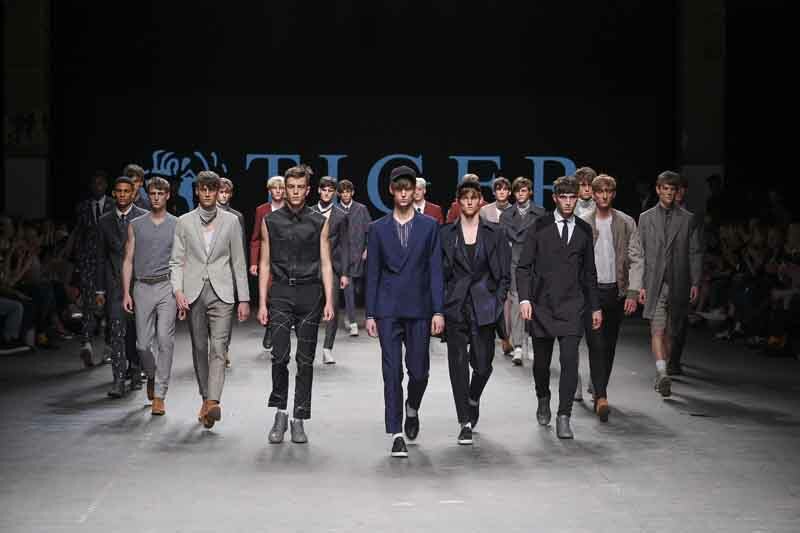 For Spring/Summer 2015, Tiger of Sweden draws inspiration from the 1979 cult film “The Warriors.” With the collection aptly titled “Tiger Gang”, collection alluded to the film’s portrayal of the gangs of New York nightly sprees. The collection might be all about men’s suits, but there is a rough and tumble mood, thus evoking a feeling of raw elegance. The clothes are designed to suit each moment of the day and each day of the week in the spirit of the trappings of the gang of the “Warriors”. The colour palette refers to the nocturnal universe, with a predominance black and white and shades of gray. The urban landscape is a reference, too, with oil tones and rust and colourful prints inspired from Street Art and graffiti of the film which contrast with the monochrome of the night.